"The NetLingo Guide to acronyms is super!" More info about "Texting Terms"
"Improve your cyber vocabulary with the NetLingo list of abbreviations!" More info about "The Dictionary"
"Want to know the meaning of an acronym? NetLingo is the place to find out!" NetLingo: The Internet Dictionary - for handy reference! "Speak geek like a net native with NetLingo!" 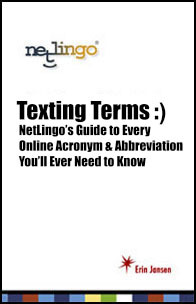 Based on popular demand, NetLingo is publishing Kindle versions of A Parent's Guide and The Largest List of Text & Chat Acronyms!